Ptolemy's Cluster (M7, NGC 6475) is a large, brilliant open cluster in the constellation Scorpius, easily seen with the naked eye, projected on a background of numerous faint and distant Milky Way stars. It was known to Ptolemy who, in AD 130, described it as the "nebula following the sting of Scorpius". 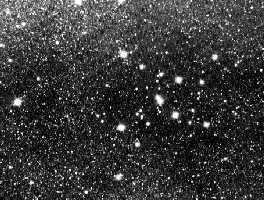 (The description may also include the nearby cluster M6 but this is uncertain.) M7 was observed by Hodierna before 1654 who counted 30 stars. In fact there are about 80 stars brighter than magnitude 10 within a region some 25 light-years across. The brightest star is a yellow giant (magnitude 5.6, spectral type G8), the hottest main sequence star is of spectral type B6 (magnitude 5.9). M7's age has been estimated at 220 million years.